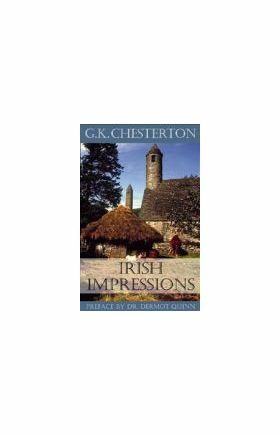 Chesterton's visit to Ireland in early 1918 resulted in this unique, readable, and thought-provoking book on Ireland and the Irish situation of the early 20th-century from one of England's greatest essayists. 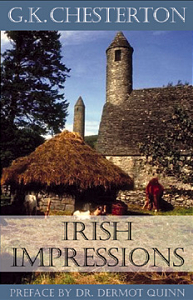 In Irish Impressions, familiar Chestertonian themes — distribution of property, industrialism, the Faith and Christian society — are discussed in the context of Ireland's struggle for national and cultural independence from the Britain of the early 1900s. Not mincing words, Chesterton points out both the strengths and weakness of the English and Irish positions during that crucial period, always with wit and wisdom — and an appreciation of religious, cultural, and economic essentials, which is characteristic of Chesterton's work. Originally published: London, 1919. IHS Press is extremely pleased to be able to offer with this newly edited, extensively footnoted edition, a new Preface by Dr. Dermot Quinn. Dr. Quinn is an Associate Professor of History at Seton Hall University, and an intimate friend and colleague of Fr. Ian Boyd of Seton Hall's Chesterton Institute. Quinn received his doctorate from Oxford University, is author of Patronage and Piety: The Politics of English Roman Catholicis, 1850 — 1900 (Stanford University Press, 1993), and is a frequent contributor to The Chesterton Review.